Chinchou in game: 4,247 Who? Important notice! Pokemon Chinchou is a fictional character of humans. 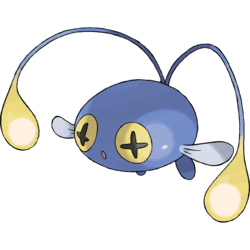 Chinchou is a small, round, blue fish-like Pokémon with a pair of tiny white fins and two small blue feet. 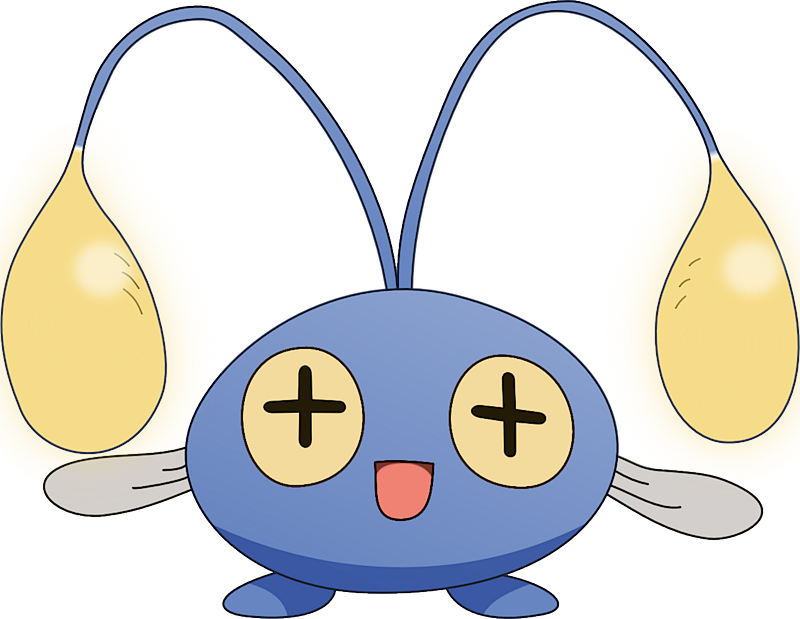 Chinchou's eyes have unique pupils that are shaped like plus signs. It has two antennae that are positioned on its rear like two tails. There is a yellow teardrop-shaped orb at the end of each antenna. 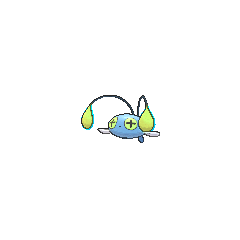 The electricity-generating cells in these antennae compose so much electrical power that they even make Chinchou tingle slightly. Chinchou charges up its electric attacks by absorbing energy through its two antennae, and flashes its electric lights to exchange signals with others. Chinchou tends to lurk on the dark ocean floors, rarely ever coming up to the surface. However, it has demonstrated the ability to walk on land. Chinchou's first major appearance was in Takin' it on the Chinchou, under the ownership of Dayton. Trinity used a Chinchou in her battle against Misty in the Whirl Cup in The Perfect Match!. It reappeared in a flashback in Espeon, Not Included. Multiple Chinchou also appeared in Pokémon Ranger and the Temple of the Sea. Chinchou first appeared in Pikachu And Pichu. 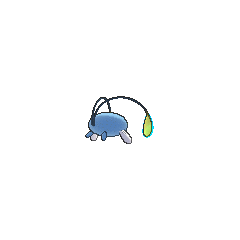 Chinchou is one of the Electric-type Pokémon that was seen in the lake with crystal in As Clear As Crystal. Multiple Chinchou were among the Pokémon living in Lake Slowpoke in Enlighten Up!. A school of Chinchou appeared in Pokémon Heroes: Latios & Latias. Also, two Chinchou along with a Mantine escorted Latias over to Ash and his friends' boat and another one competed in the Tour de Alto Mare. Multiple Chinchou appeared in the opening of Destiny Deoxys. Juan has a Chinchou that appeared in The Great Eight Fate!. A Chinchou also appeared in One Big Happiny Family! in Jessie's fantasy. Multiple Chinchou appeared in An Undersea Place to Call Home!. A Chinchou appeared in SM005, in a fantasy. EP212 Chinchou Ash's Pokédex Chinchou, the Angler Pokémon, have the ability to conduct electrical currents from their two tentacles which flow positive from one end and negative to the other. 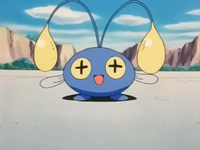 Chinchou can also communicate underwater by flashing its tentacles. Chinchou were first seen in Number One Donphan, encountered by Gold during his search for his Poliwag, where he caught multiple of them to avoid being electrocuted and later released them. In Teddiursa's Picnic a Chinchou appeared in its Poké Ball after the wild Granbull had spit out all the Poké Balls it stole to get attention about its dislocated jaw, it was later returned to its owner by Wilton afterwards. A Chinchou appeared in Skirting Around Surskit I as a rental Pokémon that Guile Hideout stole. 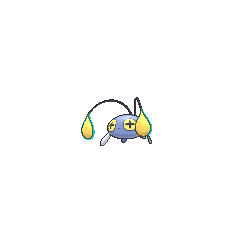 Chinchou's two antennas are filled with cells that generate strong electricity. This Pokémon's cells compose so much electrical power, it even makes itself tingle slightly.